The heavy barrelled Model No.8 below has been retro-fitted with the BSA No.FS22 or Parker-Hale No2 tunnel fore-sight introduced circa 1930. These sights are virtually indistinguishable without close inspection of the manufacturer's markings. 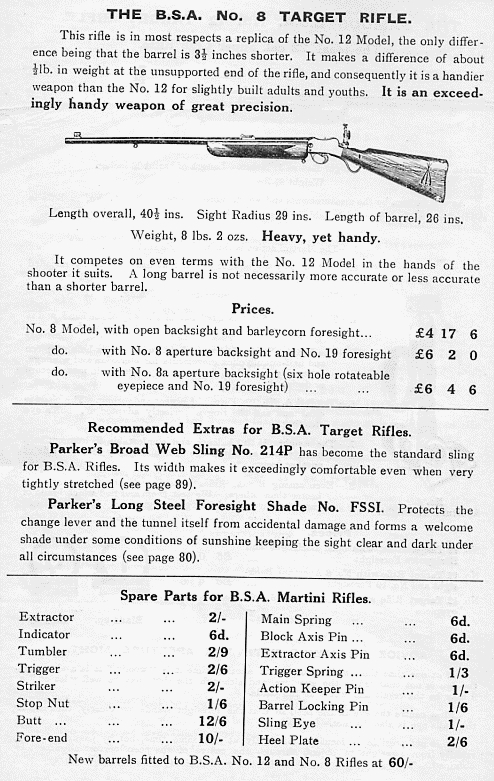 The rifle would, more usually, have left the factory with the BSA No.19 small-tunnel fore-sight. In its original configuration, with a tapered barrel and short, tapered fore-end, the Model No.8 rifle weighed in at 6lbs. 9ozs. The Model No.9 rifle, with a longer fore-end, weighed just 5ozs. more. As described in the advertisement above, the No.9 Model was as the No.8 but fitted with a long fore-end. The Model No.9 carries a similar fore-end to the Model Nos.10 and 11 rifles, in that it is a quasi-military fore-end with a single front barrel-band, but without the steel nose-cap. The later Model No.8 rifle had increased in weight considerably, by virtue of the larger fore-end now being fitted as more suitable for target shooting and the heavier - almost parallel sectioned - target barrel. All Model No.8 rifles were manufactured on the "narrow" one inch wide action body - unlike the Models 12, 13, 12/15 and 15, which were all built on the one-and-a-quarter inch ( 1.25") wide action.